Join Carmen DeFalco and John Jurkovic weekdays from Noon-2p CT on ESPN 1000, Chicagoland's leader in sports. Carmen and Jurko talk with Dan Wiederer, Jesse Rogers and Martellus Bennett. Carmen and Mike North this week talk: crazy Masters bet, difference in betting NBA playoffs vs NHL playoffs and they give their best bets of the weekend. The guys are joined by Jesse Rogers, Todd Fuhrman, Michael Wilbon and Mike North. Carmen and Jurko talk with Malika Andrews, Bradford Doolittle and Matt McMahon head coach from Murray State. Carmen and Jurko talk with Jesse Rogers and Frank Thomas. Carmen and Jurko talk with Jesse Rogers and Sal Paolantonio. Kap and Jurko talk with Rich Lerner. Mike North and Carmen DeFalco talk betting for The Masters, MLB, and the NBA playoffs. Plus, they give their weekend picks! Carmen and Jurko are joined by Rick Sutcliffe, Brian Windhorst, Jesse Rogers, and Mike North! Carmen and Jurko talk with Jesse Rogers, Vince Pelegrino and Jeff Passan. Carmen and Jurko talk with Saints head coach Sean Payton, Jesse Rogers and Bob Harig. Carmen and Jurko talk with Jon Crispin, Jesse Rogers and Mark Schlabach. Carmen and Jurko talk with Jesse Rogers and Dan Bonner. Carmen and Mike North talk about: the difficulties of betting MLB right now, theories on hedging bets, NFL futures, Final Four bets & more! The guys are joined by Scott Merkin, Fran Fraschilla, Jesse Rogers, and Mike North. Carmen and Jurko talk with Jesse Rogers, Frank Thomas and Brooks Boyer. Carmen and Jurko talk with Jim Deshaies. Carmen and Jurko talk with Tim Kurkjian, Jesse Rogers and Chuck Garfien. Carmen and Jurko talk with Jesse Rogers. Carmen talks with Tom Waddle, Kevin Fishbain, Jesse Rogers, Jon Crispin and Mike North. Carmen and Dave Revsine talk with Jesse Rogers. Carmen and Mike North recap a great weekend gambling on March Madness. Talk about revenge betting, the Zion factor and give their best bets to play this weekend. Carmen and Adam Amin talk with Jason Benetti, Sean Farnham and Pedro Gomez. Carmen and Adam Amin talk with UCF head coach Johnny Dawkins and Will Perdue. Carmen and Fred Huebner talk with Jesse Rogers. Carmen and Mike North are the Odds Couple. This week they breakdown: Vegas during March Madness, B1G10 chances in the tourney, their final fours and best bets. Carmen and Jurko talk with Mike DeCourcy, Robbie Hummel and Mike North. Carmen and Jurko talk with Bill Self, Jeff Passan, Jesse Rogers and Jon Crispin. Carmen and Jurko talk with Rece Davis and Jesse Rogers. Carmen and Jurko talk with Jesse Rogers and Scott Merkin. Carmen and Jurko talk with Rob Demovsky, Aaron Goldhammer and Jesse Rogers. Carmen and Jurko talk with Dave McMenamin and Dan Wiederer. The guys talk with Steve Lavin. The guys talk with Chuck Garfien, Andrew Siciliano and Todd Fuhrman. The guys talk with Tom Verducci and Dave Revsine. The guys talk with Ramona Shelburne and Patrick Mooney. The guys talk with Mel Kiper Jr. and Matt Vasgersian. The guys talk with Jesse Rogers and Kevin Fishbain. The guys talk with Bears WR Allen Robinson and Jesse Rogers. The guys talk with Patrick Finley, Jesse Rogers and Nick Friedell. The guys talk with Jesse Rogers and Dan Wiederer. The guys talk with Chuck Garfien and Jesse Rogers. The guys talk with Jesse Rogers and Vincent Goodwill. The guys talk with Malika Andrews, Adam Schefter, Jesse Rogers and James Fegan. The guys talk with Eddie Olczyk, Dan Shulman and Lucas Giolito. The guys talk with Tim Kurkjian, Pedro Gomez and Jesse Rogers. The guys talk with Darren Smith, Jesse Rogers and Scott Merkin. The guys talk with Jesse Rogers. They also react to the Tom Ricketts press conference from Arizona. The guys talk with Jesse Rogers. Addison Russell meets the media and CJ listen in. The guys talk with Tom Verducci, Brandon Morrow, Scott Merkin and Jesse Rogers. The guys talk with Jimmy Dykes and Jesse Rogers. The guys talk with Chuck Garfien. Carmen DeFalco and Jonathan Hood talk with Jesse Rogers and Mark Schanowski. The guys are joined by Bulls VP John Paxson to discuss this version of the rebuild. Plus Rece Davis hops on the preview Duke Virginia. Carmen and Jurko have all of the latest NBA news, they react to the Bulls trade with Kendall Gill, and Jeff Passan talks hot stove baseball. The guys talk with Malika Andrews, Jesse Rogers and Field Yates. Carmen and Jurko talk about the major topics from Super Bowl 53. Carmen and Jurko play Shot or No Shot as they sit in for David Kaplan. Carmen and Jurko talk with Rob Ninkovich and Adam Schefter. Carmen and Jurko talk with Sal Paolantonio to recap the Super Bowl. The guys talk with Adam Schefter, Todd Fuhrman and Field Yates. The guys preview the Super Bowl ahead of this weekend. They also give the latest with Anthony Davis. The guys talk with Jeff Van Gundy. The guys talk with Brett Favre and D'Marco Farr. The guys talk with Mark Schanowski and Albert Breer. The guys talk with Field Yates, Todd Fuhrman and Dylan Cease. The guys talk with Chuck Garfien and Dan Wiederer. The guys talk NFL OT rules and Super Bowl w/Adam Schefter. Then they talk MLB Hall of Fame w/Jeff Passan. Plus they discuss Zion Williamson. The guys talk with Mike Pereira and Brian Windhorst. The guys talk with Jesse Rogers and Rob Ninkovich. The guys talk with Field Yates, Todd Fuhrman and Jon Jay. The guys talk with Albert Breer. The guys talk with Adam Schefter and Dan Wiederer. The guys talk with Jeff Dickerson. Carmen and Jurko react as Bears head coach Matt Nagy and GM Ryan Pace meet the media. Carmen DeFalco talks with Dan Wiederer. The guys talk with Adam Schefter, Jeff Dickerson and Tim Kurkjian. The guys talk with Bill Barnwell, Dan Wiederer and Adam Amin. Carmen and Jurko talk with Jeff Dickerson and Sal Paolantonio following the Bears loss to the Eagles. The guys talk with Field Yates, Todd Fuhrman and Sal Paolantonio. Carmen and Jurko are joined by Dan Wiederer and Jeff Passan. Jonathan Hood is in for the guys. he talks Bears being playoff bound, NFL w/Adam Shefter, College Football w/Rece Davis and Tales From The Hood. Carmen DeFalco and John Jurkovic discuss the Bears 24-10 victory over the Vikings, talk with Jeff Dickerson and Adam Rank from the NFL Network. Fred Huebner fills in for the guys! He is joined by Field Yates, Lance Briggs, Dan Wiederer, and Chuck Garfien! David Kaplan is in for the guys. He talks Bears and Trubisky with Chris Simms and Dan Orlovsky. He talks about D RoseÃ¢`â„¢s return & talks gambling w/Philly Godfather. Fred Huebner shares Crosstalk with Marc Silverman and Jeff Meller, Matt Nagy's press conference and Bears talk with calles. The guys talk with Lance Briggs and Dan Wiederer. The guys talk with Adam Schefter and Jeff Dickerson. The guys talk with Pete Prisco and Mike Golic Jr. The guys talk with Daryl Johnston and Jeff Dickerson. Carmen DeFalco is joined by Nick Nagele, co-founder of Whiskey Acres in DeKalb, Illinois. The guys talk with Field Yates, Todd Fuhrman & Jeff Dickerson. The guys talk with Adam Schefter, Jason Wilde and Jeff Dickerson. The guys talk with Dan Wiederer and Jesse Rogers. The guys talk with Jeff Dickerson and Malika Andrews. The guys talk with Field Yates and Todd Fuhrman. The guys talk with D'Marco Farr, Lance Briggs and Dan Wiederer. The guys talk with Adam Schefter, Rece Davis and Jeff Dickerson. The guys talk with Malika Andrews and Mike Golic Jr. The guys hear from Matt Nagy and John Paxson as they both meet the media. The guys talk with Field Yates, Todd Fuhrman and Jeff Dickerson. The guys talk with Adam Schefter, Jeff Dickerson and Rece Davis. The guys talk with Bill Barnwell, Mike Golic Jr. and Mark Schanowski. The guys talk with Brian Windhorst and Howard Griffith. The guys talk with Todd Fuhrman and Jeff Dickerson. Happy Thanksgiving! The guys talk with Adam Schefter, Chef Hans and Rece Davis. The guys talk with Mike Golic Jr. and Field Yates. The guys talk to Jeff Dickerson and hear from Matt Nagy. The guy talk with Field Yates, Todd Fuhrman and Jeff Dickerson. The guys talk with Pete Berchich, Lance Briggs and Mark Giangreco. The guys talk with Dan Durkin and Mike Golic Jr. The guys talk about the Bears win over the Lions and they talk with Jeff Dickerson. The guys talk with Field Yates, Todd Fuhrman and Mike Golic Jr. The guys talk with Jesse Rogers, Lance Briggs and Jeff Dickerson. The guys talk with Adam Schefter, Rece Davis and Jesse Rogers. The guys talk with Jesse Rogers and Pat Boyle. The guys talk with Jeff Dickerson and talk about the Bears win over the Bills. The guys talk with Brian Kelly and Eddie Olczyk. Danny Zederman The Armchair Nutritionist talks with Chris Kresser about saturated fats & cholesterol, probiotics & gut microbiome, Intermittent Fasting & the Ancestral Diet. 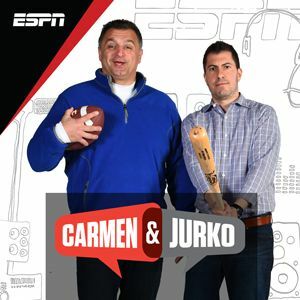 Adam Schefter and Rece Davis join Carmen & Jurko. The guys talk with Nick Friedell and Mike Golic Jr. The guys talk with Jeff Dickerson and talk about the Bears win over the Jets. The guys talk with Field Yates, Todd Fuhrman and Pete Prisco. The guys talk with Jeff Dickerson, Lance Briggs and Mark Schanowski. The guys talk with Adam Schefter and Rece Davis. The guys talk about the Bears loss to the Patriots and talk with Dan Wiederer. The guys talk with Field Yates, Todd Fuhrman and Rob Ninkovich. The guys talk with Brian Windhorst, Lance Briggs and Jeff Dickerson. The guys talk with Mike Golic Jr. They are also joined by Waddle and Silvy. The guys talk with Jeff Dickerson and Snoop Dogg. The guys talk with Harry Teinowitz, Jeff Dickerson and Todd Fuhrman. The guys talk with Jeff Dickerson, Ryen Russillo and Field Yates. The guys talk with Chris Mortensen, Mike Golic Jr. and Neil deGrasse Tyson. The guys talk with Jeff Dickerson, Waddle and Silvy. Carmen, Jurko, and Silvy are joined by Field Yates, Todd Fuhrman, Dave Revsine, and Mark Giangreco! The guys talk with Jesse Rogers and Mike Golic Jr. The guys talk with Adam Schefter and Jesse Rogers. The guys talk with Jesse Rogers and Jessica Mendoza. The guys talk with Jesse Rogers, Field Yates, Todd Fuhrman and Booger McFarland. The guys talk with Dan Durkin, Lance Briggs and Jesse Rogers. The guys talk with Jesse Rogers and Bill Barnwell. The guys talk with Dan Wiederer, Mark Schlereth and Jesse Rogers. The guys are joined by Field Yates, Todd Fuhrman and Tim Kurkjian. Carmen talks with Shams Charania, Lance Briggs and Mike Golic Jr. The guys talk with Dan Wiederer and Jesse Rogers following a big Bears win on Monday Night Football. The guys talk with Jesse Rogers, Dan Wiederer and Brock Huard. The guys talk with Field Yates, Todd Fuhrman and Jesse Rogers. The guys talk with Adam Schefter, Tracy Butler, Rece Davis and Jesse Rogers. The guys talk with Jesse Rogers, Mike Golic Jr. and Bill Barnwell. The guys hear from Matt Nagy and talk about the Bears loss to the Packers last night. The guys talk with Adam Schefter, Tracy Butler and Lance Briggs. The guys talk with Dan Shulman, Rece Davis and Jason Wilde. The guys talk with Dan Wiederer, Mike Golic Jr. and Jesse Rogers. Jurko talks with Kevin Fishbain, Jesse Rogers and Silvy. Jesse and Jurko talk with Jesse Chavez and Dan Wiederer. Jurko and Waddle talk with Jesse Rogers, Rece Davis and Pat Fitzgerald. The guys talk with Jeff Dickerson, Jesse Rogers and Doug Glanville. The guys talk with Jesse Rogers and Patrick Finley. Danny Zederman The Armchair Nutritionist talks with Nina Teicholz about our fear of fat, our bodies fuel sources, the changing dietary guidelines & intermittent fasting. Carmen talks with Bill Melton, Albert Breer and Jesse Rogers. Carmen and Jonathan talk with Dan Wiederer and Tim Kurkjian. Carmen and Jonathan talk with Scott Merkin, Jesse Rogers and Patrick Finley. Carmen and Jonathan talk with Trey Wingo, Jesse Rogers and Chris Getz. Carmen and Jonathan talk with Jesse Rogers, Kevin Fishbain and Chuck Garfien. The guys talk with Lou Canellis and Jesse Rogers. The guys talk with Patrick Finley and Jesse Rogers. The guys talk with Jesse Rogers. The guys talk with Jesse Rogers and Patrick Finley. They also hear the press conference from Halas Hall with Matt Nagy and Roquan Smith. The guys talk with Jessica Mendoza and Jesse Rogers. The guys talk with Adam Amin and Jesse Rogers. The guys talk with Tom Verducci, Jesse Rogers and Andrew Brandt. The guys talk with Nick Friedell live from Bears camp. Carmen and Jurko live from Canton, as we celebrate HOF'er Brian Urlacher. We hear from Greg Blache, Lance Briggs, Ron Rivera, Lovie Smith and Brian Urlacher himself. The guys are live from Canton, OH. They talk to Dan Wiederer, Greg Blache, Brian Urlacher and Lance Briggs. The guys talk with Jesse Rogers, Dan Wiederer and Sal Paolantonio. The guys talk with Jesse Rogers and Pete Prisco. The guys talk with Jesse Rogers and Adam Schefter. The guys talk with Kyle Long, Dan Wiederer and Matt Vasgersian. The guys talk with Jason Wilde, Sahadev Sharma and Patrick Finley. The guys talk with Peggy Kusinski, Jesse Rogers and Field Yates. The guys talk with Emily Kaplan and Teddy Greenstein. The guys talk with Dan Wiederer live from Bears training camp. Chet Coppock talks with Kevin Butler, Jesse Rogers, Denis Savard, John Mullin and Brian Baldinger.